Shirt, vintage. Jeans, Gina Tricot. Shoes, Sam Edelman. Hat, Zara. Cross, vintage from Miami. RED. Been wearing this vintage shirt a lot lately, love the mismatched patterns! 7 bilder av en outfit? boring, virkelig nødvendig eller? i’m in love with your boots! amazing where are they from? Normally this is the type of shirt that I would give a second glance to if I saw it in a thrift store but you make it look so good! Love it with the red lips. Loved your outfit! Very 80’s indeed… Your boots are amazing! I love this outfit! Love the red shirt and the leggings! Oh my God! I love that shirt! love your shirt!! beautiful pictures! You need to wear some different shoes! Mix it up a bit. I love you blog and outfits but those shoes were so over once they reproduced them. Also, I love your hair! Oh I’m in love with your jacket and your shoes ! I love this skirt , what a find! That is honestly one of the cooles tshirts I’ve EVER seen!!!! Great look, but then again you can rock anything! That is an AWESOME outfit. What a find! i love that shirt and you look gorgeous in these pics! LOVE LOVE LOVE the hole look! You look so cool!!! The top looks amazing. I love the combinations of the stripes and dots. Very vibrant color too! this is a stunning look, every piece is perfect! i’m in love with the shirt…i’ve always loved oversized shirts and this is taking it to the next level. Excellent top darling. 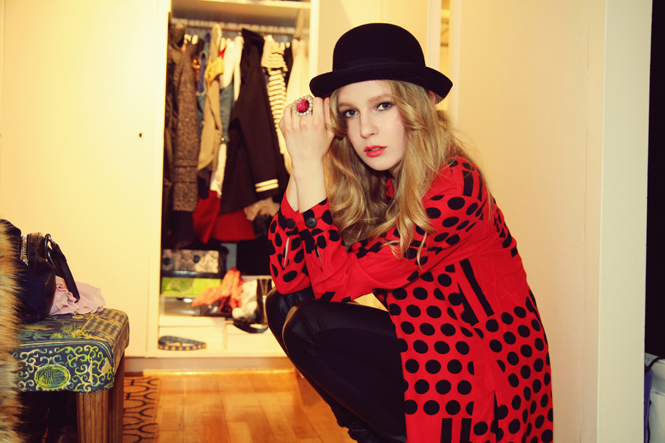 Love the polka-dots paired with the bowler hat. Genius. I love the blouse so vintage!! loooveeeeee the blouse!! so cute!!! I’ve been searching for that kind of hat for so long, would love to get myself one! That shirt is hard to pull off, but you made it work. Looks good! cute! i like that color on u ! Wow,I never see like this shirt!! AWESOME. amazing shirt! looks like it’s a vintage moschino! I love the red! I’m sorry to spam, but I have gorgeous giveaway going on in my blog right now! Please come and see! I love this; it looks great on you! like Ã bad girl. nice boots i love it ! You have such effortless style! You can rock anything. You’re definitely rockin that lipstick too. Do you mind sharing what lipstick that is? Thanks hun! Paige: Thanks! :) Sure, it’s YSL Rouge Volupté, I think the color is called 27 Rose Paris! hi!i’m an italian fashion blogger i would like to say u that you’re in a post in my blog about denim. You should do a makeup tutorial! I just read your whole blog and I think that it’s beautiful. 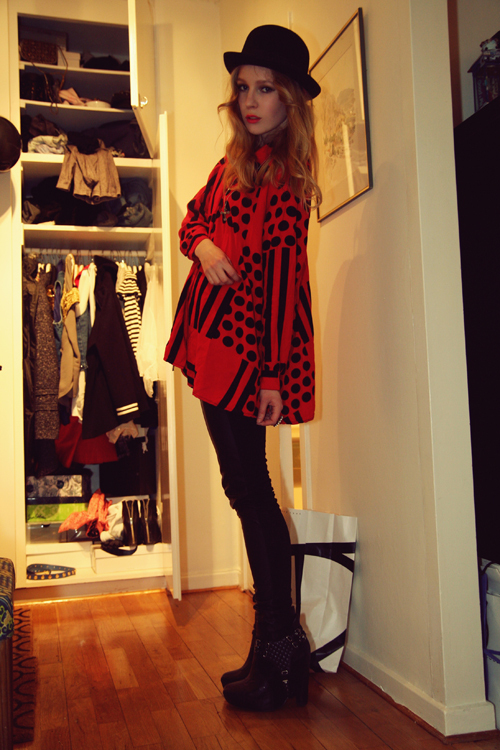 not only the shirt and the boots rock, but your playful tone is sooo fun! keep it up! 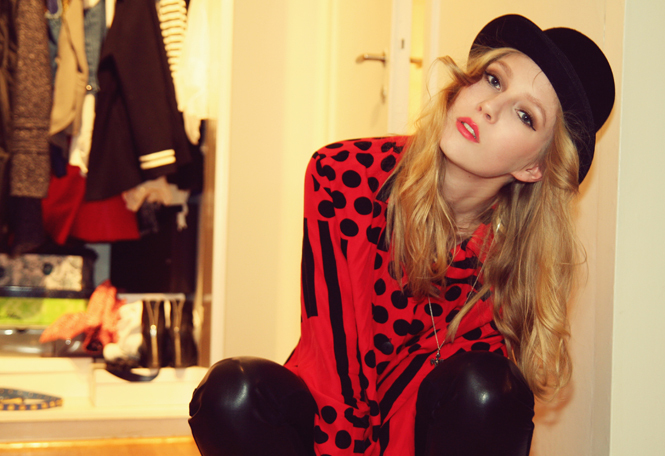 Love the red and black ensemble! You look so gorgeous…as always! Love the shirt, the shoes are amazing and the combination with the hat and pants is perfect! like a ladybird. but rock. LOVE! You look as thought you are modeling for Minimarket. i love this look! its amazing! Love the shirt totally eighties meets MC Hammer! Ooh! I haven’t been on here for a while, but I’m glad I visited. You look ever-so-lush! Did you do something new to your hair? I wanna marry your outfit! I love that vintage shirt! This is amazing, love the ladybird look with the red and black. Oh and I want those shoes. stat! Your Blog and Style is impeccable! I absolutely love it!!!!! This outfit has to be my favourite of the whole week, your top is amazingly kooky and the whole outfit is quirky! Amazing look! I deduce you like ankle boots wit a rock touch, so I recommend you that visit Shoespanish.com. It’s a Spanish online shop with the colleciÃ³n of the Spanish designer Paco Gil. There’s a pair of black ankle boots of this style… marvellous! !